This is for all the K341 and M16 engines including K341A, K341AS, K341AQS or any k341with any suffix on it. 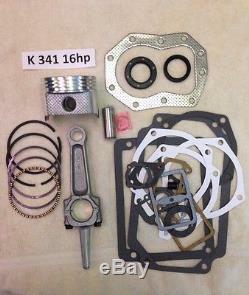 Kit includes : EVERYTHING TO MAKE YOUR K341 ENGINE LIKE NEW AGAIN. What you see in the picture is what you will receive plus a Kohler rebuilding manual at www. KIT INCLUDES TH E FOLLOWING. New Piston : PISTON COMES IN choice of : Standard, . 010 over, 020 over or. CONNECTING ROD COMES IN : Standard or. I will send standard size PERIOD! 020 rod without paying for it!!!! Anybody can Rebuild a Kohler engine themselves. 010 Piston and Rings and 1.5 = Standard Rod. Do not give me the measurment, give me the size. When measuring cylinder bore, please measure the cylinder wall approx. 1inch down the cylinder wall for correct measurement. These measurments are not for machine shop referance. The machine shop needs the NEW piston before they can bore the cylinder. If they try and bore your block without having the piston, go to a different machine shop. 16 HP STANDARD Cylinder Bore 3.750 +. 040 3.790 CONNECTING ROD. 020 and not paying for it does not work and a 010 rod will be sent. (MOST COMMON FAILURE ON A NEW REBUILT ENGINE IS IMPROPER ROD INSTALLATION), I WILL GIVE YOU THE SHEET THAT TELLS YOU HOW TO INSTALL THE ROD PROPERLY (The oil hole goes toward the cam). If interested I offer a 16 HP rebuild with a Free!!! Tune Up In my other auctions and valves. I also offer high Quality, cost saving tools and other COMPLETE Engine Rebuild, Refresh Engine Rebuild Kits to rebuild your own engine, so please check out my other auctions for tools, lawn, tractor seats and other rebuild kits. PLEASE FEEL FREE TO VIEW OUR FEEDBACKS. PRICE, on this same QUALITY KIT. The item "ENGINE REBUILD KIT for KOHLER 16HP K341 and M16 with an actual 16hp rod not 12hp" is in sale since Thursday, April 17, 2014. This item is in the category "Home & Garden\Yard, Garden & Outdoor Living\Lawn Mowers\Lawn Mower Parts & Accessories".